I don’t like showing too much skin during the summer. 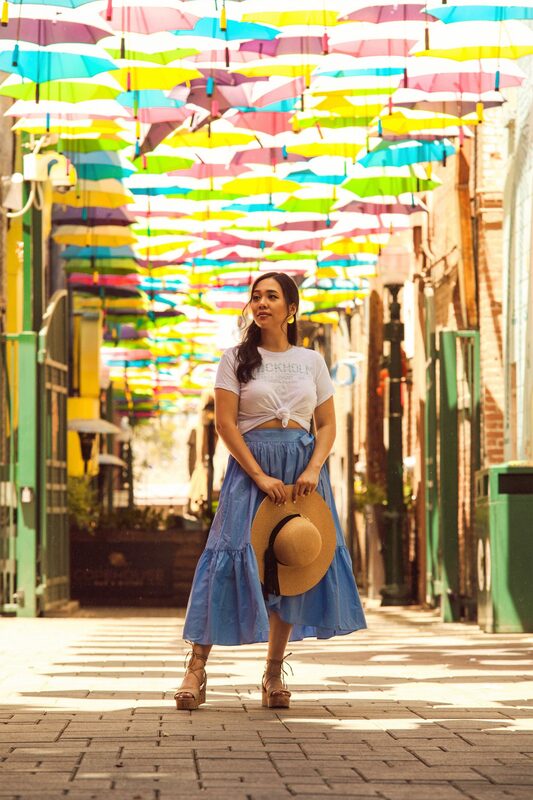 Even though Southern California heat makes it unbearable to cover up, I prefer to stay away from short-shorts and skirts to minimize the risk of flashing my bum (as I last discussed in one of my most recent blog posts, 5 Comfy Summer Solutions for Curvy Girls With Big Butts). 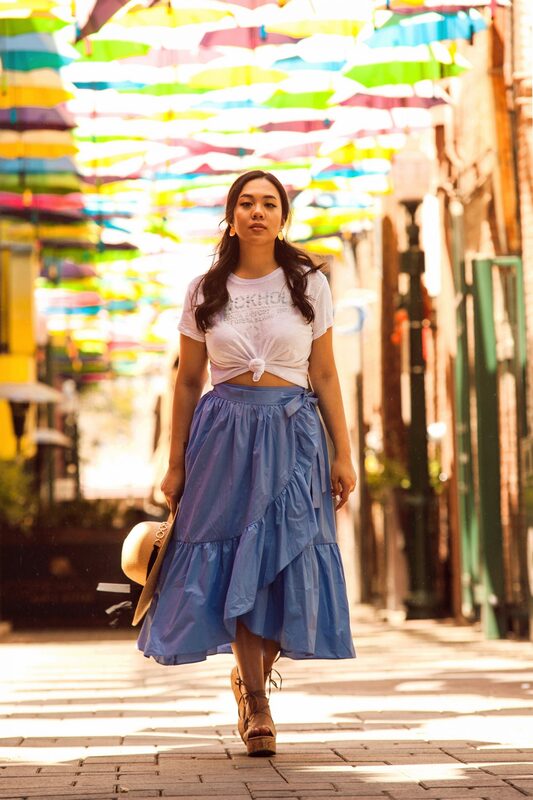 When the maxi skirt came back into trend a few years ago, I was obsessed and started buying as many maxi skirts as I could! Stretchy cotton-polyester blend full-length skirts were my summer staple, paired along with a tank top or T-shirt. But sometimes I want the comfort and coverage of a maxi skirt but something with a little more oomph, you know? This summer, I’ve gotten a little more creative by investing in far-from-basic pieces to spice up my summer maxi skirt outfits. Here are my 5 favorite kinds! I know most people take the opportunity during the summer to tan, so why not wear an outfit that shows off your legs? Skirts with slits are a great way to break up the shape of the maxi with vertical lines and helps ventilate to keep you cool. My skirt is by BB Dakota and on sale at Shopbop. Shopbop might be a bit more on the pricier side but they do have super awesome sales all the time, so it gives us a chance to get quality items and designer labels for a fraction of the price. Seriously, their BB Dakota sale items are around $30 – $40 and I love the styles! Cute stuff, but not too bold or trendy to go out of style by next season, and still made well. Forever 21 and GoJane both have a lot of basic slitted maxi skirts under $20 that are more suitable for casual everyday wear but can still be styled with a T-shirt and gladiator sandals. Button-up details on maxi skirts are something I didn’t realize I liked so much until I got my hands on the aforementioned BB Dakota skirt. It’s a really interesting detail that isn’t super bold, but the vertical line down the middle gives the illusion of longer legs and also accentuates your hips. The buttons also distract from problem areas! A shorter front and longer back on a maxi skirt give you the best of both worlds: you can show off your legs but still have the protection you need in the back if you prefer modest coverage. My skirt is from Legato Apparel and it’s actually a midi skirt. I ordered a size M, but it looks a little longer on me – I think with the elastic waist I could have easily gone down to a S and still fit it. It’s still super cute though and would pair perfectly with a white blouse or crop top for vacation! Prints are so perfect for spring and summer. Some people don’t like the bulk of ruffles or other details, but prints can add some visual depth and distract from trouble areas without adding too much extra fabric. Probably my favorite out of the bunch! 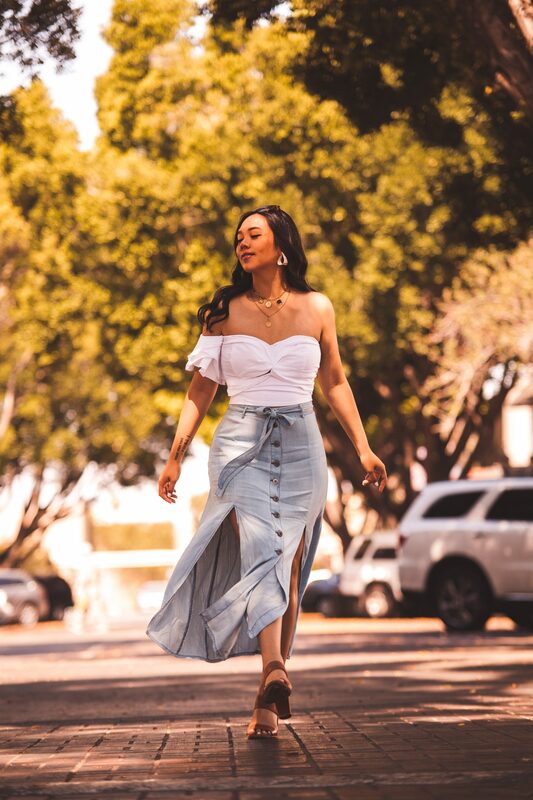 Wrap skirts are so forgiving, so if you’ve been staying indoors and eating out of boredom to stay out of the heat, you’ll love how adjustable they are since they don’t feel like they’re squeezing your waist. And since a lot of them have a ruffle trim, it’ll help hide some of your trouble spots if you’ve eaten 1 too many pieces of barbeque at that pool party. My wrap skirt is normally $90 but is on sale for $63. And it’s from English Factory, one of my favorite Shopbop brands! They have a lot of affordable and cute stripes, gingham and pastel pieces perfect for summertime that are on sale. What are your favorite kinds of maxi skirts during the summer heat? Drop a comment below and don’t forget to subscribe to my newsletter for more styling tips and sales. Wow, this collection maxi skirt is awesome, would love to try some of these outfits.